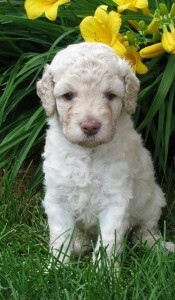 At Labradoodles of the North we want to send our puppies to their new families as well socialized pups. We take a number of steps that are based on animal behavior research to ensure that our puppies have had the necessary experiences for them thrive. 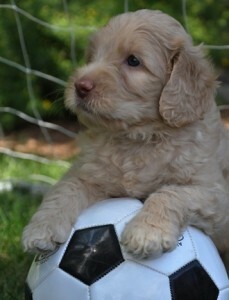 We give our puppies a solid foundation on which to achieve their fullest potential as your new family member. This section should give you an idea of the events and exposure your puppy has while with us. It’s a guideline detailing the time, effort and love that goes into each of our puppies. Hopefully, it will give you confidence in the fact that you are purchasing a well socialized pup that has been given the best start in life. Research has shown that a litter is more docile when the mother dog is petted. It has a calming effect on the offspring that she is carrying. 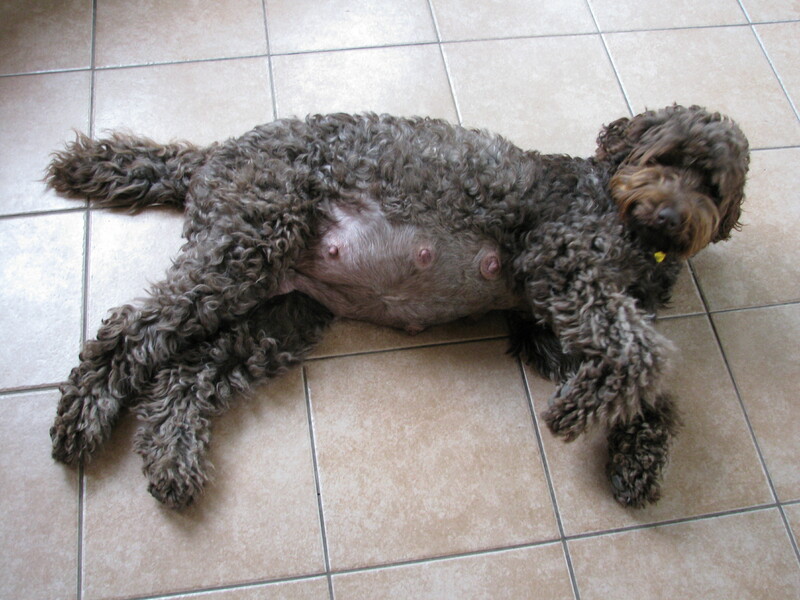 A low stress environment for the pregnant mother has shown to produce puppies that are more emotionally balanced. We provide our mothers-to-be with this type of calm and loving environment. Puppies of this age can’t hear or see very well. 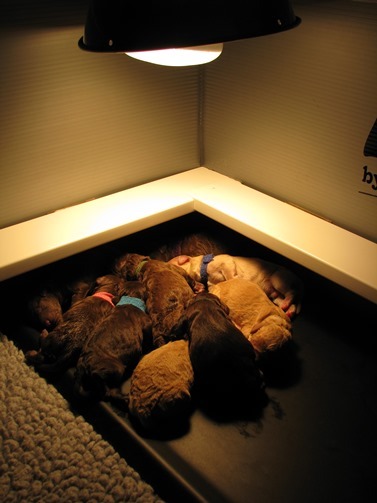 They enjoy being in their whelping box with their mother and their litter mates. Tactile stimulation – holding the pup in one hand, the handler gently stimulates the pup between the toes on any one foot using a Q-tip. Time of stimulation 3 – 5 seconds. Head held erect – using both hands, the pup is held perpendicular to the ground. Time of stimulation 3 – 5 seconds. Head pointed down – holding the pup firmly with both hands the head is reversed and is pointed downward so that it is pointing towards the ground. Time of stimulation 3 – 5 seconds. Supine position – holding the pup so that its back is resting in the palm of both hands with its muzzle facing the ceiling. Time of stimulation 3-5 seconds. Thermal stimulation – using a damp towel that has been cooled in a refrigerator for at least five minutes. The pup is placed on the towel, feet down. It is not restrained from moving. Time of stimulation 3-5 seconds. These exercises impact the neurological system by jump starting it into action earlier than would otherwise be expected. The benefits include: improved cardio vascular performance (heart rate), stronger heart beats, stronger adrenal glands, more tolerance to stress and a greater resistance to disease. Dr. Michael Fox conducted a study showing that puppies that have been mildly stressed during the first 5 weeks will develop into dogs which are superior when put in learning or competitive situations. They are better able to handle stress, are more outgoing and learn more quickly. Mild physical stress at an early age will actually increase the size of the brain. So, we provide challenges such as removing the pup from its mother by only a foot and placing an easily overcome barrier in the way. The puppy has to orientate itself, make it over the simple barrier to find its mother. This sort of challenge is designed for the puppy to succeed and then be rewarded for its efforts. This will build the pup’s confidence. Our family interacts with them and handles each puppy multiple times per day. We take the puppies on car rides as studies have shown that early car rides can reduce the chances of a puppy developing car sickness later on. During this stage, puppies’ eyes open and they begin to hear. They also start to learn how to walk on wobbly legs. Puppies are capable of responding to taste and smell. We start to introduce new items of interest to the whelping box. Simple things such as a cardboard box, plastic milk jug, new piece of flooring or knotted towel. Since they can now respond to smell, we begin to introduce some new scents. An introduction with a friendly cat is on the agenda. Positive and rewarding challenges are continued from the Neonatal stage. The early neurological stimulation exercises also continue into this stage. 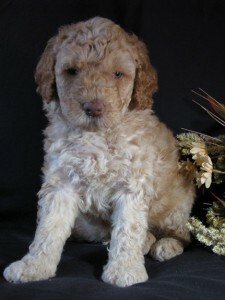 Puppies interact with our family and are handled on a daily basis. This is a time of very rapid sensory development. Puppies are able to use their senses of sight and hearing. We keep a very stable environment during this short period because with all the new things the puppies are taking in, we want to make sure they don’t get overwhelmed. Each day we take them out and introduce them to a new flooring type such as: concrete, linoleum, carpet, wood, grass. Now that their sense of hearing is developed, we start to introduce sounds. This is done gradually both in noise types and noise volumes. We continue to introduce the puppies to different scents. Some more physical and mental challenges are offered to the puppies. They are continuously interacting with us and our children and are being handled daily. You wouldn’t think that a dog needs to learn to be a dog, but they do! This is a very important time for puppies. They learn basic dog behavior like barking, biting, fighting, chasing and body postures. They learn to play with their litter mates and how to relate to other dogs. The puppies even develop a pack hierarchy through play. Puppies learn to accept discipline from their mother and about submissive posturing. It is also during this stage that the mother will start to wean her puppies. We encourage lots of play time. A puppy at play is such a wonderful thing! This is the time when we introduce a crate. The puppies are developing the innate desire to eliminate outside of the sleeping/play area. We introduce the crate as a safe sleeping area at least 3 feet from the area we want them to start eliminating in. This will help make house training easier. Each puppy is given lots of one-on-one time with us. We take the puppies to car rides. This is the period when we start to work on separation. We want separation to have positive associations, so we start gradually giving each pup a bit of time on their own. 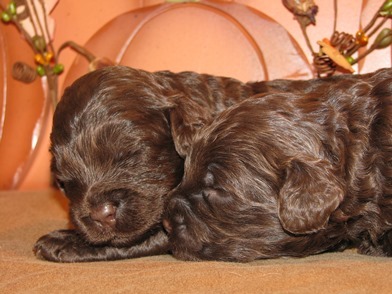 We provide the puppies with a sensory rich environment. Exposure to new sounds, scents, and challenges is continued. Once they have had their shots, we begin with the introduction of strangers: tall, short, large and small. Those with beards, canes, and funny hats! We begin doing some positive training sessions once they’re 35 days old. Once they have their shots, they get to venture outside for some serious exploring. At 49 days old, we have a temperament test performed on each puppy to further assess their personality so that we can place them with the most suitable family. By this time, puppies should be completely weaned. This period is when the most rapid learning occurs. Things that happen now will have the greatest impact on puppy’s future social behavior. Puppies at this stage have an easier time accepting new situations, objects, noises, etc. As the puppies get older it will be harder for them to become comfortable with new things. For their remaining time with us we will introduce them to as many people as we can. We want them to have seen a whole range of different people before leaving us. More playtime with mom and litter mates. We will continue to reinforce the potty area and continue to increase their separation time. Lots of love and caring, with attention given to one-on-one time with each pup. Mental and physical challenges will continue. Short, positive training sessions will be a regular event. By now, puppies should be very familiar with their crates, many noises, flooring types, scents, people of different ages, and so much more! Once they get home to you, there is still so much for them to see and learn. Enroll in a puppy socialization class and have fun with your Labradoodles of the North puppy!